The cries of terror and disbelief continue. Teenagers lie down in front of the White House to protest the nation’s tepid, stalled gun-control legislation. Parents grieve for their children and stare at the wound carved into the American soul. Assault rifles have more rights than schoolchildren. A movement simmers, or so it seems, a week after the latest deadly school shooting: seventeen people killed at Marjory Stoneman Douglas High School in Parkland, Florida, many more injured. A disturbed loner — yet another one — is arrested. It’s not simply violence, but wildly profound violation, yet again, yet again, of the deepest of human values: Life is sacred. There’s a bigger problem embedded in the social order than our lack of effective gun laws, and I hope the movement that emerges out of the Parkland massacre makes the leap beyond anger and single-issue politics. The nation’s weak gun laws — the easy availability of AR-15 assault rifles — are, in fact, a symptom of the general cheapening of human life in American society, which is reflected in the nation’s ever-expanding obsession with war and a military budget the size of Godzilla. War always has a way of coming home. Easy access to assault rifles is a symptom of the cheapening of human life in American society. The kids at Marjory Stoneman Douglas High School might agree. Of course, Plan Bush has morphed into Plan Obama and, now, Plan Trump, whose recent budget proposal for next year allots $716 billion to the Department of Defense. The problem with this, beyond the fact that this kind of spending on “defense” shrivels social spending to a bare minimum, is that planning for war — celebrating war, glorifying war — has a long-term psychological impact on a large segment of society. To prepare for war begins with belief in an enemy and, eventually, the will to kill that enemy. But as David Grossman, a psychologist and former military man, pointed out some years ago in his book On Killing: The Psychological Cost of Learning to Kill in War and Society, most people have a natural aversion to killing other human beings, which is a problem for those in charge of waging war. Grossman points out that researchers in World War II discovered, based on a large number of interviews with soldiers who had been in combat, that no more than 15 or 20 percent of them would actually point their guns at the enemy and fire. This led to changes in the training process meant to “disengage” recruits from their troublesome aversion to killing, such as replacing bull’s-eye targets with human figures during marksmanship training. The process of “disengagement” became a standard part of basic training, and its success was seen during the Vietnam War, when soldiers’ willingness to fire at the enemy soared to over 90 percent, according to Grossman. The guy’s name was Mad Dog Mattis. He’s now, of course, America’s secretary of defense. Once again, I go back to the gargantuan military budget, and the preparations underway for eternal investment in the culture of death. As Danny Sjursen pointed out recently at TomDispatch, the Pentagon’s game plan includes preparation for conflict with world competitors at every level: from Russia and China to Iran and North Korea to the array of stateless terrorists our wars have created across the Middle East and Africa. On the domestic front, conservatives like Rush Limbaugh shill for gun manufacturers by calling for arming America’s schoolteachers rather than controlling the sale of firearms. And a disturbed 19-year-old who has just been expelled from his high school can purchase an assault rifle and ammo without a problem. I have a dark fear that it’s all connected. Editor’s Note: Robert Koehler is an award-winning, Chicago-based journalist and nationally syndicated writer. While he may not write specifically about mimetic theory, his articles demonstrate the contagious nature of violence, and more importantly, inspire hope in the contagious power of compassion. We are honored to feature his articles every week. His book, Courage Grows Strong at the Wound, is available. Contact him or visit his website. 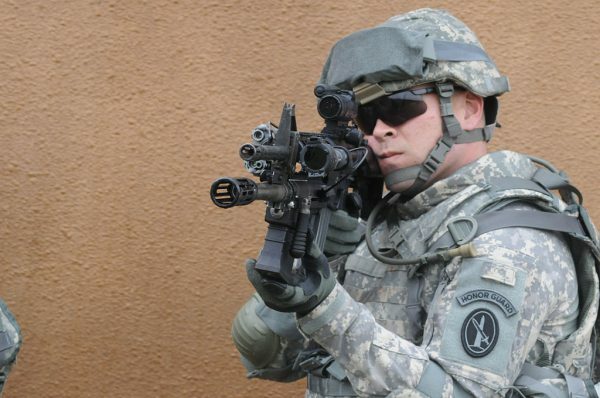 Image: “Soldier pointing a M26Shotgun on M4 Carbine” by PEOSoldier. Available on Flickr via Creative Commons Attribution 2.0 Generic license.